Subscribe to "Mind in Renewal"
As I wrap up this series, I just want to comment on and express my deepest concern with the problem of fear. And that is simply this: that if we are afraid of man and what he can do to us, we will be inhibited in our service of the Lord. Just think about it. We are called to share the Gospel, to take the Good News of Jesus’ salvation to all the world (Mark 16:15). We aren’t just going to go where it’s safe and comfortable. We are called to go everywhere, at risk of our lives and comfort. You see, Jesus promised that as Christians we will suffer, at one point or another, in our service of Him. But we are told this, not so we will be afraid, but so that we will be prepared. In fact, to counter the fear that might arise, Jesus said “But not a hair of your head will perish.” This is to assure us and to embolden us in the face of fear as we seek to serve Christ even in the most hostile of situations. “Do not fear, for I am with you; Do not anxiously look about you, for I am your God I will strengthen you, surely I will help you, Surely I will uphold you with My righteous right hand (Isaiah 41:10)”. So, this is my challenge to you: Go forth and serve the Lord with gladness and fear Him alone (Deuteronomy 10:20; Psalm 100:2). Never let your fear inhibit you in your service to the Lord. Focus on Jesus and His promises that can defeat the fear within your heart, for nothing is more damaging in our service to the Lord tahn to be afraid. I hope that you are emboldened and set on fire to serve the Lord this day. While I am in a book reviewing mood, I thought I’d put a plug in for a book that I have been thoroughly enjoying recently. 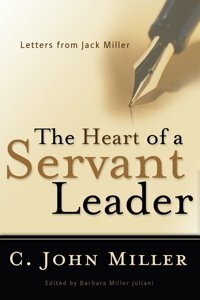 The book is The Heart of a Servant Leader, by C. John Miller (who goes by the name of Jack). Jack was an average pastor (New Life Presbyterian Church in Philadelphia) who after years of ministry realized that He must make the Gospel central to his life in everything he did. Once he implemented that, God blessed him by growing New Life both in membership, but most importantly in the Lord. Also, God saved many through him as Jack witnessed everywhere he went. And somehow he was able to mentor many Christians in their faith. And that’s really what this book is. It’s a collection of letters from a godly mentor to Christians seeking to serve God, not only in leadership positions, but in all of life. I appreciate his God-given wisdom and I thank God for allowing him to live and write these letters. When I get to Heaven, I can’t wait to meet Jack. On this day in 1820, American hymnwriter, Fanny Crosby was born. During her life, she composed nearly 8,000 hymns. Despite her physical blindness, she saw the light. Praise God that she did! This week’s quote is from John Piper, pastor of Bethlehem Baptist Church and author of many books including Don’t Waste Your Life and Desiring God. This is probaby his most famous quote and one that has impacted many lives including my own. God is most glorified in us when we are most satisfied in Him. I am so thankful that even on days when I complain and don’t honor God as I ought to, I am still drenched in the mercy of God. Even when I’m down right disobedient and ungrateful, God still extends His grace to me. For me, when I recognize God’s grace in these times, I am most amazed by ít and led to repent of my wrong attitudes and pride. I guess I shouldn’t be surprised though, because God’s not the one that’s unfaithful. Yesterday, I attended the funeral of a man that my mom called her “second dad”. It was a sad time, but a good chance to remember this man who was a Marine to the core and who loved his family and friends. The memories that were shared and the service in its entirety was a good chance for everyone to grieve their loss. All in all, I think it was good experience. Though there are different interpretations of this, I think what David is saying is that he will not fear death or any evil in it. This is monumental because, as humans, the fear of death has to be one of the biggest fears in our lives. And yet David, speaking of going through death, says that he will not fear evil. Why? The answer is that death is what David calls a shadow. But what does that mean? You see, for those whose trust is in the Lord, death is nothing more than a shadow. It might be dark and scary and might make you shiver when it passes over you, but it is absolutely harmless. Shadows never hurt anyone. And that is what death is to us. It might look scary and painful, but it can’t hurt us. Not ultimately, and not if our hope is in the Lord. Death is simply a passage into life. And not just life, a life that is infinite joy and bliss without any pain, sickness, sorrow, or death ever again. It is through death that we attain this life. Just as once the shadow passes over us the sun will shine again. Josh Brahm provides shows some facts that were either misrepresented or left out by news sources in the recent stem cell controversy. In Matthew 5:8, Jesus says “Blessed are the pure in heart, for they shall see God.” I have mulled over this verse in my mind a good bit lately, and I have finally come to realize (as with many portions of Scripture) that this verse has more to it than I first thought. The obvious meaning of the verse is that those who are pure (cleansed, without blemish) will see God when they die because they will go to Heaven. In that sense, it simply means that those who are saved are washed by Christ’s blood and therefore made pure in heart. And in Greek, the heart was the center of being. Therefore, we see that those who are saved will see God because He will purify them with His blood. While I believe that this is definitely true, I believe there’s more to this than first appears. It is most certainly and unequivocally true that when we are saved, Christ’s blood and righteousness cover us, (1 Corinthians 1:30; Hebrews 9:22) we are seen as pure in God’s eyes and we do not need to add anything to Christ’s work in order to get to Heaven. We are secure and pure. This is what is called redemption and it is completed in the moment we believe in faith on the Lord Jesus. But there is another work that is done through the Holy Spirit and Christ’s sacrifice within our lives that is not completed at the beginning of our salvation. In fact, it’s not even completed in this lifetime. That work is called sanctification. This leads me to think about the word pure. In a sense we are pure, but in another we’re not. Our lives are still full of sin, but we are able to enter the gates of Heaven, because when God looks at us He sees the purity of Christ. We have attained saving righteousness (purity) because Christ has given it to us, but we have not attained purity of actions or heart. Not yet. So when Jesus says that the pure in heart shall see God, He is not just referring to the purification that comes through salvation. In that sense, all Christians are pure in heart. But this purity of the heart is one that comes not instantly like salvation, but slowly in the process of sanctification. Katharos, the Greek word for pure in this verse, first means “purified by fire“(Greek Lexicon, emphasis mine). So, how does this definition apply to this verse? You see, for us to be sanctified, to be purified, we must go through fire. But what kind of fire? I think that it could be said that when we, as Christians pass through difficult times in our lives with perseverance (whether it’s a death or sickness or divorce or losing a job or whatever difficulty it may be), it is for our purification. These are the means by which God seeks to sanctify us and perfect us. No one has a great spurt of growth in their faith or is revealed the deep secrets of God in the easy times of life. And if people do grow in the good times, it is because they have learned to trust God in the difficult times beforehand. So purity of heart is a result of going through the fires of hard times. I hope that this encourages us as we go through the tough times. Never think that God lets anything happen that is not for our good (Romans 8:28). Everything, whether good or bad, will ultimately be used for our good and purification. May we be purified through the fire by God’s good will. I have decided to start a new weekly post: “The Quote of the Week”. Each Sunday (Lord willing and assuming I am able), I will post a thoughtful quote from wise and mature Christians both past and present that will hopefully encourage thought within the minds of other Christians seeking to grow in their knowledge of God. 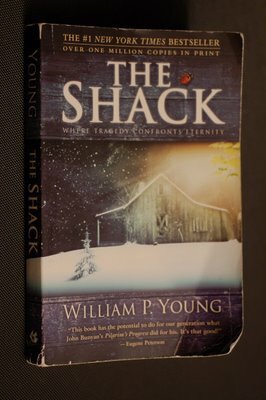 Though I’ve wanted to refrain from commenting on this issue, the book The Shack by William P. Young has caused loads of controversy throughout this country and others. Though I do believe there are things that seem good in this book, the negative and misleading aspects of the book outweigh any good that it is worth. However, I realize that there are some who will disagree with me on this who I might sincerely agree with on more important issues. For those who want to know more about this book and its author, Kendall Adams has done a helpful interview with Young. It seems that Young knows less of what he’s talking about than he should and his answers are a little hard to understand. Also, he flatly denies substitutionary atonement which is disheartening, but I encourage anyone interested to listen to this interview. I just pray that maybe Young would grow some in certain areas and that Christians who disagree with him will be patient and gracious and listen carefully to what he and others like him would have to say. We do not have to settle for anything less than the truth, but we can patiently discuss the issues in this book with those people in the hope of helping them further understand the grace of God.